A combined project by Abhishek, amit and me. Connect this circuit to any of your home appliances (lamp,fan, radio, etc) to make the appliance turn on/off from a TV, VCD or DVD remote control. 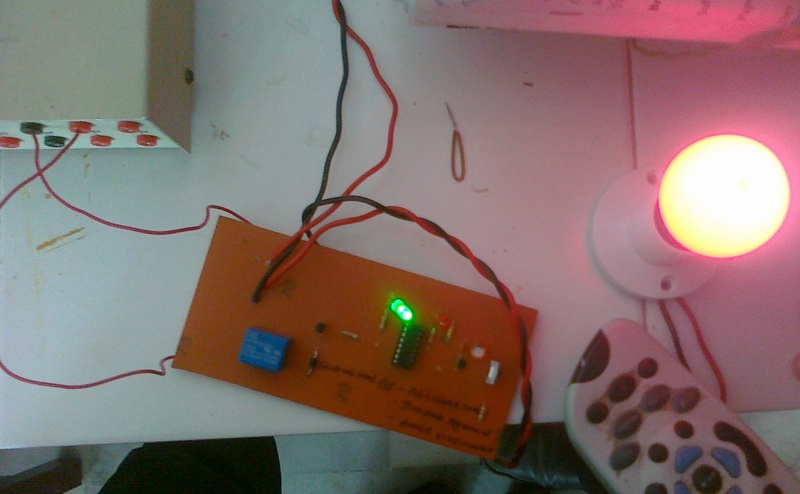 The circuit can be activated from up to 10 metres.The 38kHz infrared (IR) rays generated by the remote control are received by IR receiver module TSOP1738 of the circuit. 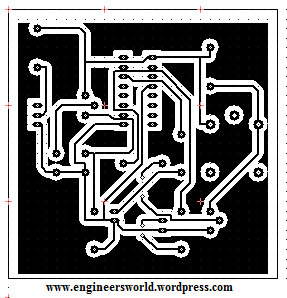 Its a new simplified form of PCB layout of above project. 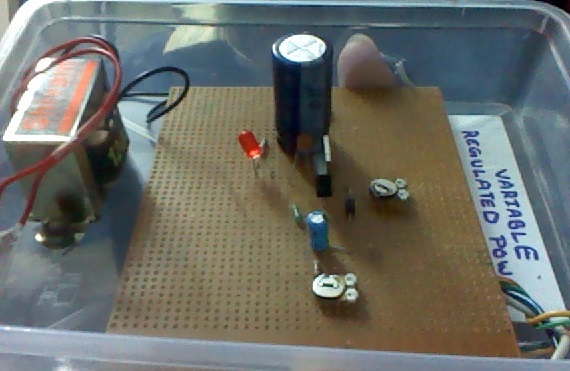 The project “VARIABLE REGULATED POWER SUPPLY” plays a very important role in the laboratory functions and that is mainly to the electronics labs. 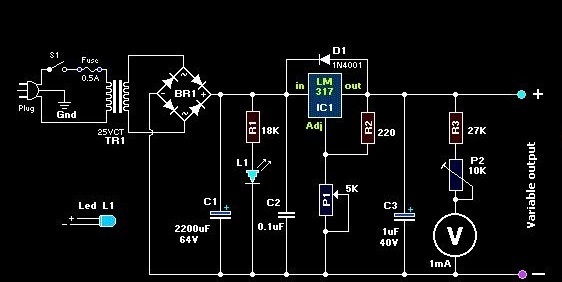 As in electronics all the instruments, components work on a particular regulated dc supply ,so a project which can provide this supply by converting the alternating current to direct current that too into a great range of regulated power keep its own preference. As it can produce a range of 0-30 v direct current by regulating and converting alternating current is has a vast application too. Such converters are also known as “Switch Mode Power Supply” (SMPS). AC to DC converters generally comprise a rectifier bridge to rectify the AC current of the input line and a regulating device supplying on output of one or more regulated DC voltages. 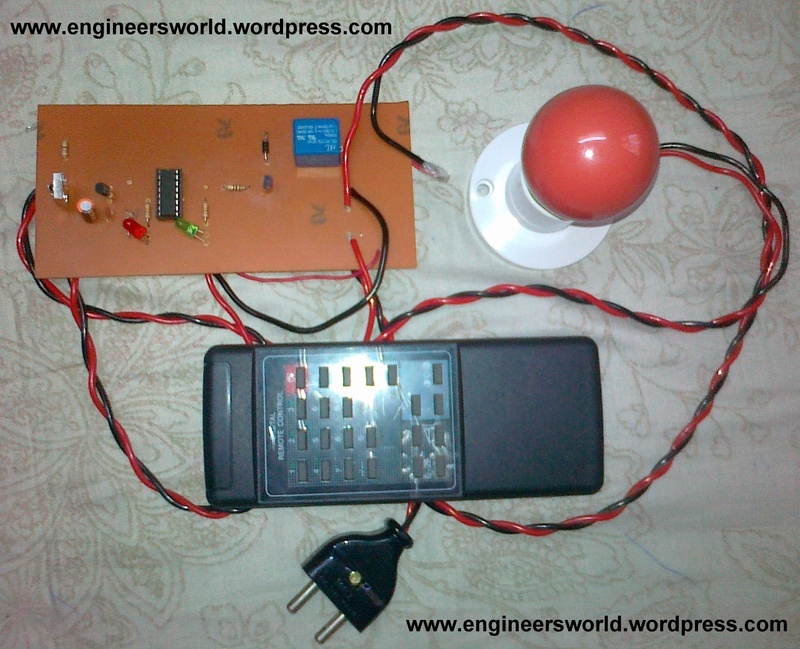 Just the simple ac current is applied and through potentiometer you get the desired regulated dc power supply. The 110V-AC coming from the powercord is fed to the transformer TR1 via the on-off switch and the 500mA fuse. The 30v ac output (approximately) from the transformer is presented to the BR1, the bridge-rectifier, and here rectified from AC (Alternating Current) to DC (Direct Current). If you don’t want to spend the money for a Bridge Rectifier, you can easily use four general purpose 1N4004 diodes. The pulsating DC output is filtered via the 2200µF capacitor (to make it more manageable for the regulator) and fed to ‘IN’-put of the adjustable LM317 regulator (IC1). The output of this regulator is your adjustable voltage of 1.2 to 30 volts varied via the ‘Adj’ pin and the 5K pot meter P1. The large value of C1 makes for a good, low ripple output voltage. without any problems). Because of this the voltage at the output can never decrease below 1.2 volts, but as the potentiometer (P1) increases in resistance the voltage across it, due to current from the regulator plus current from R2, its voltage increases. This increases the output voltage. D1 is a general purpose 1N4001 diode, used as a feedback blocker. It steers any current that might be coming from the device under power around the regulator to prevent the regulator from being damaged. Such reverse currents usually occur when devices are powered down. The ‘ON’ Led will be lit via the 18K resistor R1. The current through the led will be between 12 – 20mA @ 2V depending on the type and color Led you are using. C2 is a 0.1µF (100nF) decoupler capacitor to filter out the transient noise which can be induced into the supply by stray magnetic fields. Under normal conditions this capacitor is only required if the regulator is far away from the filter cap, but I added it anyway. C3 improves transient response. This means that while the regulator may perform perfectly at DC and at low frequencies, (regulating the voltage regardless of the load current), at higher frequencies it may be less effective. Adding this 1 µF capacitor should improve the response at those frequencies. R3 and the trimmer pot (P2) allows you to ‘zero’ your meter to a set voltage. The meter is a 30Volt type with an internal resistance of 85 ohms. I you have or obtained a meter with a different Ri (internal resistance) you will have to adjust R3 to keep the current of meter to 1mA. Just another note in regards this meter, use the reading as a guideline. The reading may or may not be off by about 0.75volts at full scale, meaning if your meter indicates 30 volts it may be in reality almost 31 volts or 29 volts. If you need a more precise voltage, then use your multimeter.